There are defining moments in any player or coach's career, and Carlo Ancelotti identified one player that had a key role in his further success: Zinedine Zidane. The Italian coach spoke to Corriere dello Sport ahead of Napoli's game against Lazio, discussing his different stints as coach for Milan, Real Madrid and Juventus. His stint with the bianconeri was not as successful, but he had the chance to build the foundations that eventually led to his success in almost every league he's coached in. Furthermore, he admitted that Zidane played a key role in his growth as a coach. "When I coached Juventus, Zidane made me change my views on football. I planned my lineups without using a playmaker, and Zidane's presence forced me to do that. I created my team around him, it was like a tailor-made suit for Zidane to wear. I changed my views on football and I owe it all to him," Ancelotti said. 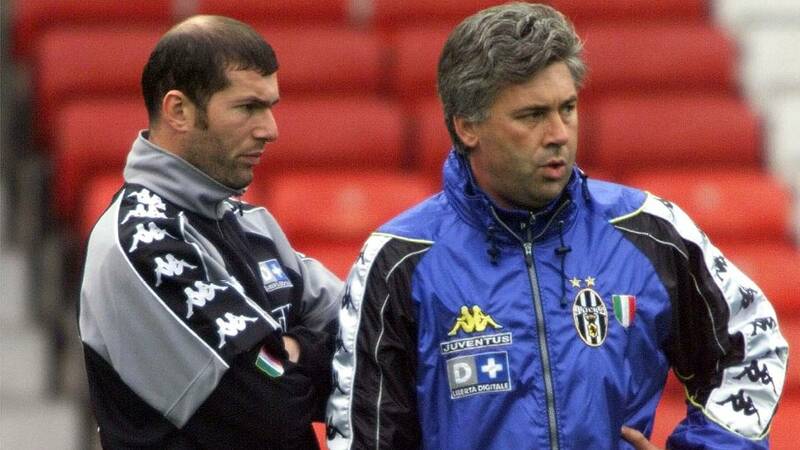 Zidane and Ancelotti back when "Carletto" coached the bianconeri. Ancelotti added that he missed the chance of working with Roberto Baggio due to his prior views on football, since he was not used to field a playmaker and Baggio had requested to play in that spot of the pitch. Then, Ancelotti looked back to his years as Real Madrid boss. Despite his abrupt exit, Ancelotti seems to have fond memories of his stint with Los Blancos. "Everyone knows I can't compare Milan to any other team, but out of the rest, I choose Real Madrid. Every coach should be given a chance to work for such a massive team and to live in a city as lovely as Madrid," Ancelotti added.